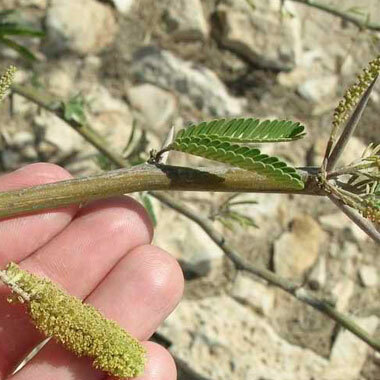 Qatar e-Nature – Mesquite, Ghwoef. Growth form: Tree. Flowering. Oct–Jan, Mar–May. Status: Introduced. Very common. Also recorded: Bahrain, E Saudi Arabia, UAE. Habitat & distribution: Occasional to abundant or dominant in sandy areas, disturbed habitats and cultivated areas. Originally planted in and around towns and villages but now naturalised and has spread into desert areas. Several authors note that it is an invasive species and may compete with native trees. Many municipalities in the region have tried to eradicate the species with poison, burning and uprooting, but this is unlikely to be effective since it is now well established in various habitats and produces large quantities of seeds (see also Uses). A prominent individual specimen stands on the island in Doha Bay, formerly known as Palm Tree Island. Since August 2005 it has not been irigated but seemingly survives in good condition. Uses: Jongbloed et al. note that the ‘pods are nutritious and valuable as fodder’, although Cornes & Cornes say that the foliage is apparently unpalatable as it is never browsed. This species may be best managed by using for charcoal production, which would have environmental benefits by reducing the need to import charcoal originating from tropical sources. There have been claiMohammed Al Safran that the species causes allergies, but there seeMohammed Al Safran to be a lack of substantial scientific evidence for this. The plant is a traditional remedy for cataRenee Richerh, colds, dysentery, inFloweringammation, stomach-ache, sore throats and wounds; the root has diuretic properties (Rizk & El-Ghazaly).